The Great White North has found a way to provide universal healthcare with more salubrious results and trimmed national costs. Take notes, America. The United States scores dramatically lower than other high-income countries in healthcare benchmarks, despite overspending them. A recent report published in JAMA suggests this discrepancy results from runaway administrative costs and U.S. practitioners charging more for the same medical services. By taking lessons from Canada’s single-payer system, the U.S. may be able to reduce its healthcare costs but simultaneously improve medical access for wider range of the population. Americans are split over Canada’s single-payer healthcare system. Some see it as a model to be adopted by the United States. Others see it as an inefficient system that will hinder America’s competitive edge. Proponents of either side can, of course, regale you with stories of former neighbors, distant cousins, or one-time coworkers who fled across the border to seek that elusively greener healthcare on the other side. In truth, each system has its flaws. Canada’s healthcare is universal, assuming you ignore the gaping oversight of not covering essential prescriptions; meanwhile, the U.S. has some of the best healthcare in the world, if you don’t mind bankrolling a litany of unnecessary tests and treatments. But Canada dominates its southern neighbor in one healthcare facet: cost savings. Despite publicly funding universal healthcare, Canada spent only 10.45 percent of its national GDP in 2014. 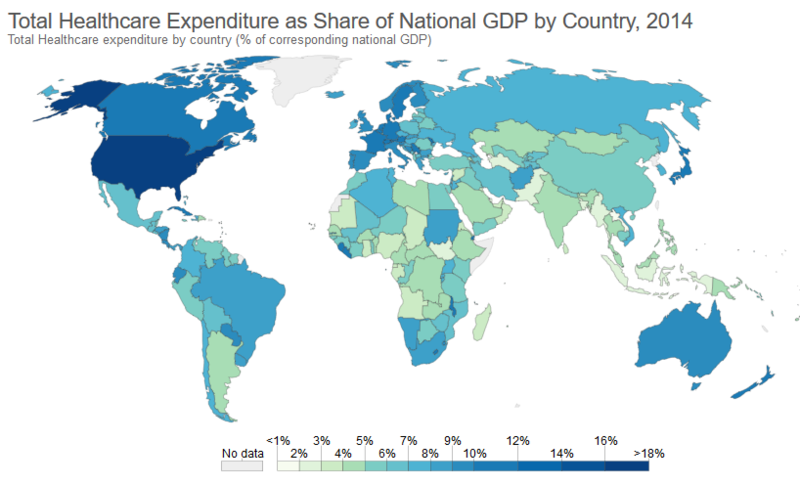 The United State’s expenditure was 17.4 percent of GDP. Per capita, Canada spent $4,641. The U.S.? Double that. How does Canada do so much more with less? In 2014, Canada spent 10.45 percent of its national GDP on healthcare. The United State’s expenditure was 17.4 percent. According to a report published in the Journal of the American Medical Association, the reason the U.S. outspends Canada — and 10 other high-income countries —is not due to social spending or healthcare utilization. The culprit was price inflation across the board. The report detailed that in the U.S. medical practitioners earn significantly more, individual services cost more, and Americans spend more on pharmaceuticals per capita. Administrative costs were also singled out as a major price driver. According to the report, U.S. administration accounted for 8 percent of healthcare expenditures. In other high-income countries, that amount ranged from 1 to 3 percent. A simplified overview of the U.S. healthcare system shows it comprises Medicaid, Medicare, Tricare, the Veteran’s Health Administration, and a panoply of private health plans. Further adding to the discombobulation, many Americans manage coverage through a patchwork of policies. A senior citizen, for example, may be on Medicare (a government-run program) but augment her coverage with a Medigap policy (insurance provided by a private company specifically to offset Medicare costs). Meanwhile, the Great White North is currently debating whether to extend universal healthcare to encompass prescriptions. A report published in the Canadian Medical Association Journal, titled “How to pay for national insurance,” found that implementing such a plan in 2020 would require $9.7 billion in new public funding. The benefits? In addition to providing universal access to pharmaceuticals, national pharmacare would save the private sector $13.9 billion, a net savings of $4.2 billion. So how much would America save if it adopted Canada’s low cost, universal approach? According to a Commonwealth Fund report, the U.S. would save $1.4 trillion if it adopted Canada’s healthcare approach. 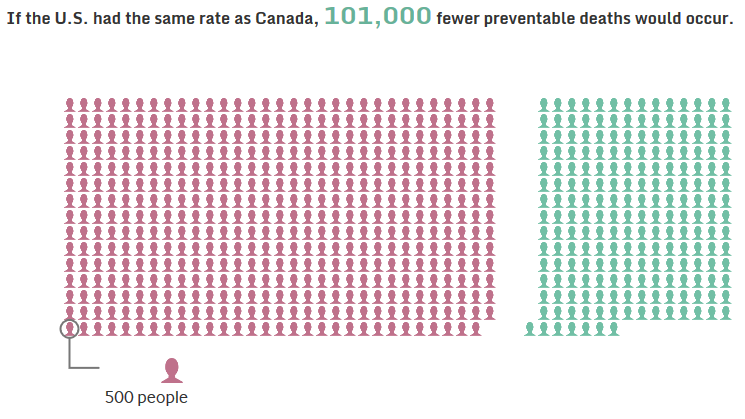 If the U.S. adopted Canada’s healthcare approach, it could save as many as 101,000 lives from preventable deaths. The United States’ unprecedented spending would be worthwhile if it could produce results above and beyond those of Canada and other high-income countries. Sadly, the data suggests the opposite is true. As noted in the JAMA report, the U.S. system covers less of its population — 90 percent compared to the 99–100 percent range of its peers. Americans go to the doctor less often and spend fewer recover days in the hospital. The consequences of these differences are stark. Canadian citizens sport a higher life expectancy (82.21 years compared with 79.24 in the U.S.). The country’s maternal mortality rate is also significantly lower. Only 27 pregnant women died in Canada in 2015, compared with 550 in the U.S. In fact, the United States’ maternal mortality rate is the worst in the developed world. As for those infamous Canadian wait times, they do exist but their effect on the Canadian healthcare system has been greatly exaggerated. They are mostly applied to elective procedures as a means of reducing cost. As such, adopting Canada’s healthcare approach would save the U.S. more than money. The aforementioned Commonwealth Fund report noted that the U.S. would avoid 101,000 fewer preventable deaths, 4,800 fewer infant deaths, and 42 million fewer American adults neglecting care because of costs. How is it that the U.S. system outspends so many other high-income countries, yet produces far less salubrious outcomes? The answer is an unequal distribution of healthcare, with spending being concentrated at the socio-economic top. In the United States, the top 1 percent of spenders account for more than 20 percent of total healthcare expenditures. The spending of the top 5 percent accounts for almost half. In contrast, Canada uses cost control to curb administration costs, allowing the country to cast a wider healthcare safety net that extends from the top to the bottom. In sum, Canada’s healthcare system isn’t without its flaws, but we shouldn’t make the best the enemy of the good. If the United States would learn from Canada’s example, it could do a lot of good — and save some money in the process. Previous New Study Confirms That American Workers Are Getting Ripped Off!